Thus far in this series, we've focused on the records of the Supreme Court as a whole, of Chief Justice Roberts, and of Justice Scalia. We looked at how the Court decided and how those Justices voted in cases involving issues of racial discrimination. Now let's turn to Justice Anthony Kennedy. In doing so, we'll juxtapose his voting record alongside that of Roberts and Scalia. As in the last two posts, let's start with the bluntest voting breakdown we've been considering: how frequently Justice Kennedy supported complaints brought by Whites and how frequently he supported complaints brought by Racial Minorities. Here are the figures for Kennedy--again, depicted alongside those for Roberts and Scalia. 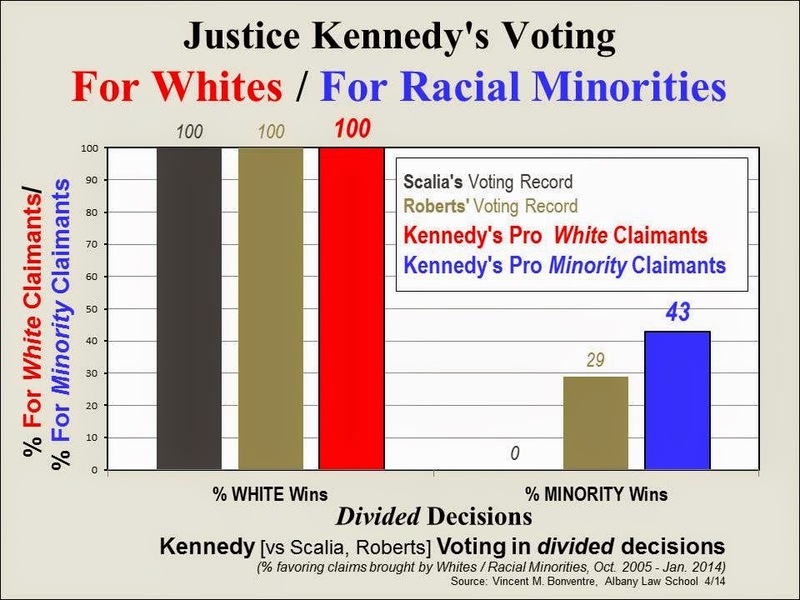 As depicted in graph 1, Kennedy voted to uphold every claim (7 out of 7) involving racial discrimination brought by Whites. As we've seen previously in this series for Roberts and Scalia, Kennedy's record in support of complaints brought by Whites was a perfect 100%. Regarding complaints brought by Racial Minorities, Kennedy supported roughly half of them. Notably, his record of 45% (5 out of 11) to uphold Racial Minority claims is higher than Roberts', and much higher than Scalia's. Kennedy's record would seem to be consistent with his reputation for being more ideologically moderate on many issues than the other conservatives on the Court. That contrast is sharper when we exclude cases with unanimous decisions--i.e., cases where the issues seemed clear enough that all the Justices agreed, including Scalia. So, considering only the non-unanimous, closer cases--those where the Justices were divided--here's what Justice Kennedy's record looks like, alongside Roberts' and Scalia's. 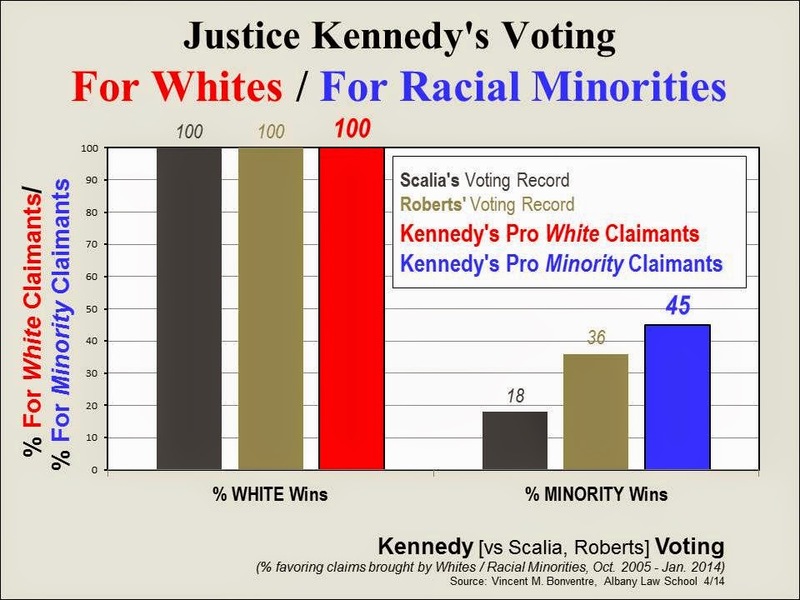 Of course, the 100% pro-White claimant voting record of Kennedy, as well as that of Roberts and Scalia, does not change. The 3 of them voted to uphold the White complaint in every case, whether the racial discrimination issue was clear or close, whether the Court's decision was unanimous or divided. As for Kennedy's voting on complaints brought by Racial Minorities, his record is virtually the same when the unanimous decisions are excluded. But the contrast between his record and that of Roberts and Scalia is even more stark. 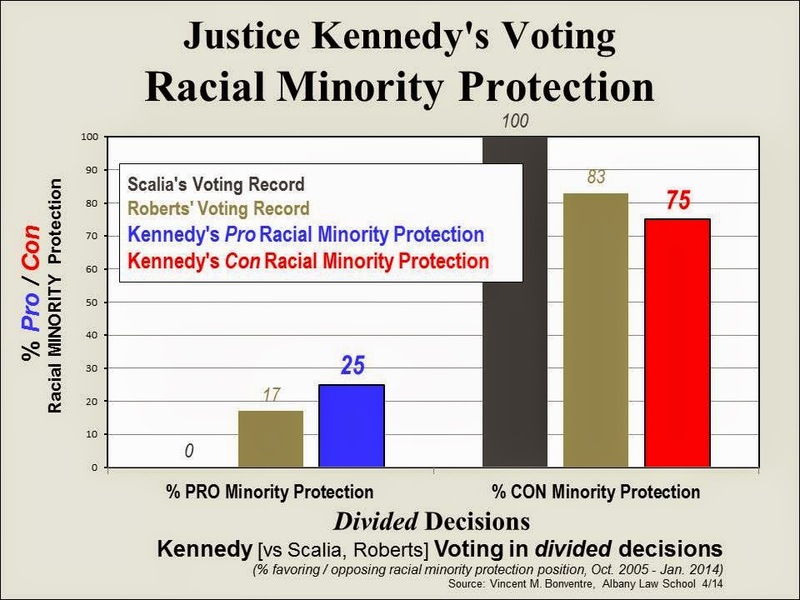 Kennedy's 43% (3 out of 7) record of support for Racial Minority complaints is higher than Roberts' 23% record, and infinitely higher than Scalia's 0%. Again, the figures do seem to reflect that Kennedy is in fact somewhat of a moderate--certainly when compared to Scalia. Now what about Kennedy's voting for equal treatment? That is, equal protection without any regard for race, without any regard for who brought the complaint or for whether Whites or Racial Minorities would benefit. How frequently did Kennedy vote to support strict equal treatment or measures to insure that, and how frequently did he vote the opposite? Here it is--again, considering only those close, non-unanimous cases. Kennedy's record is 50-50. In half of the cases he supported equal treatment or measures promoting it, and in half he didn't. His record for strict equality is somewhat stronger than that of Roberts, and double that of Scalia. Finally, how does Kennedy's voting record on equal treatment--as well as his record on complaints brought by Whites and those by Racial Minorities--translate into support for protecting Racial Minorities? In other words, how frequently did Kennedy vote for the position that would protect or promote the protection of Racial Minorities against discrimination? 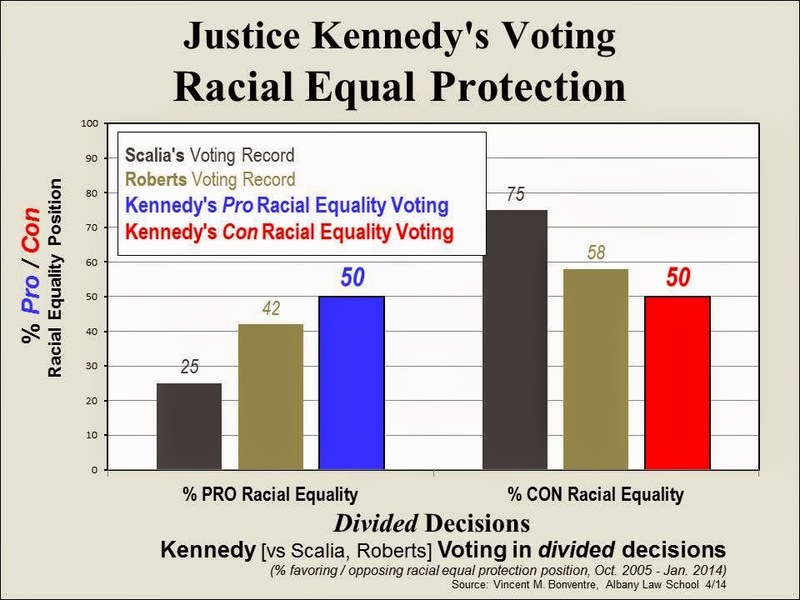 As depicted in graph 4, Kennedy voted for the position favoring Racial Minorities in 25% (3 out of 12) of the divided racial discrimination cases. Stated otherwise, he voted against the position that would have protected Racial Minorities or promoted their interests in 75% of those cases. And yet, as lopsided as Kennedy's record would seem, it is less so than Roberts', and considerably less so than Scalia's. While Kennedy voted against the pro-Racial Minority position in 9 out of the 12 divided cases, Scalia voted that way in every case. Like Roberts, Kennedy voted with the majority in CBOCS West v Humphries (2008) to hold that it was a civil rights violation (Civil Rights Act section 1981) to retaliate against an employee for complaining about racial discrimination. And like Roberts, he voted with the majority in Snyder v Louisiana (2008) to condemn the prosecution's exclusion of jurors based on their race. Scalia disagreed in both cases. Additionally, in League of Latin American Citizens v. Perry (2006), Kennedy wrote the majority opinion to hold that Texas violated the Voting Rights Act by enacting a redistricting plan that diluted Latino voting strength. In that case, both Roberts and Scalia disagreed. So, Kennedy's voting record in cases involving issues of racial discrimination is certainly one that strongly supported claims brought by Whites, that supported claims brought by Racial Minorities about half the time, that supported race-neutral equality half the time, and that largely rejected positions intended to protect Racial Minorities. Kennedy's record might not be as extreme as Scalia's. But it is unmistakably an ideologically-conservative one. Next in this series: Justice Thomas. "There has been a wide variety of such cases [i.e., cases involving issues of racial discrimination]before the Roberts Court. Cases dealing with issues critical to the nation's approach to racial equal protection. Issues involving such matters as voting rights, affirmative action in education and employment, race-based gerrymandering, race-based promotions and terminations, race-based jury selection, retaliation against discrimination complainants, etc.